Whether it was the intention of Barbara Mauritz or someone on the business side of her affairs, Bring Out the Sun leaves the impression that she was being groomed for a solo career. The impression is hardly subtle or accidental: the album is co-billed to Barbara Mauritz and Lamb, and although Lamb co-founder Bob Swanson is still aboard as guitarist and (on half of the tracks) as a sole or collaborating composer, there are some songs on which he doesn't play at all. 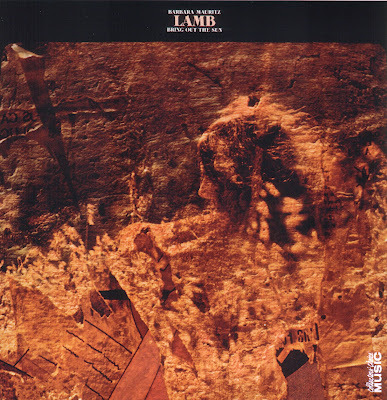 Lamb's second album, Cross Between, had a much higher proportion of gospel-oriented material than their debut, and Bring Out the Sun continues the move to contemporary gospel-rock of sorts, particularly on side one. As a consequence, it's by a considerable margin the most mainstream of Lamb's albums, and also by a considerable margin the least interesting. That hardly means that it's bad: Mauritz is quite a soulful singer, and the way she handles gospel-slanted stuff is reminiscent of the way another idiosyncratic vocalist, Annisette of Savage Rose, performed gospel-rock on some of the early-'70s Savage Rose albums (though Annisette was considerably quirkier). But the gospel-soul-ragtime-slanted tunes have a simpler, more upbeat tone that isn't nearly as intriguing as Lamb's more ambitious recordings, although one, "River of Boulevard," became Mauritz's best-known composition when it was covered by the Pointer Sisters on their self-titled Top 20 album in 1973. Yet side two gets considerably more interesting, "Salty" allowing Mauritz her furthest stretch into jazz torch singing territory. And, oddly, "The Vine" and "Live to Your Heart" end the album on its most adventurous note. Both songs sound much like they'd been recorded during the sessions for Lamb's first two LPs, as they revert to the slightly disturbing minor-keyed jazz-folk singer/songwriting, classical-tinged arrangements, and dream imagery-laden lyrics characteristic of the band's earlier work. And even on side one, the brief Mauritz solo instrumental piano piece "The Wish" makes a nice quasi-classical break on this uneven but worthwhile capper to Lamb's career.